To assess efficacy and safety of monopolar enucleation of the prostate (MEP) and to compare it with the current treatment standard for medium-sized prostates, < 80 cc, transurethral resection of the prostate (TURP). A prospective analysis patients undergoing a surgical procedure for their diagnosis of BPH (benign prostatic hyperplasia) (IPSS > 20, Qmax < 10; prostate volume < 80 cc) was performed. IPSS, Qmax were assessed preoperatively, at 6 and 12 months postoperatively. The complications were classified according to the modified Clavien–Dindo grading system. A total of 134 patients were included in the study: 70 underwent MEP and 64 - TURP for BPH (mean prostate volumes were comparable with p = 0.163). The mean surgery time was 44 min in the TURP group and 48.2 min in the MEP group, (p = 0.026). Catheterization time for MEP was 1.7 and 3.2 days for TURP (p < 0.001). Hospital stay for MEP was 3.2 days vs. 4.8 days for TURP (p < 0.001). 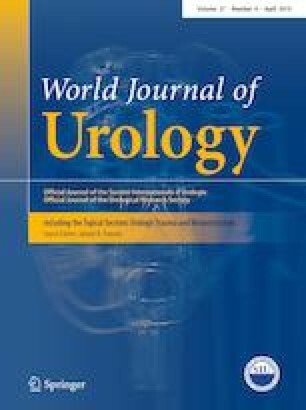 Both techniques shown comparable efficiency in benign prostatic obstruction relief with IPSS drop in MEP from 23.1 to 5.9 and in TURP group from 22.8 to 7.3, whereas Qmax increased from 8.2 to 20.5 after MEP and from 8.3 and 19.9 after TURP. Urinary incontinence rate after catheter removal in TURP group was 9.0% and 7.8% in MEP group, at 1 year follow-up, it was 1.4% and 3.1% in MEP and TURP, respectively (p = 0.466). Our experience demonstrated that MEP is an effective and safe BPH treatment option combining the efficacy of endoscopic enucleation techniques and accessibility of conventional TURP. DE—manuscript writing/editing; protocol/project development; LR—protocol/project development; MG—protocol/project development; SA—data collection and management; JI—data collection and management; MT—manuscript writing/editing; protocol/project development; data collection and analysis; EL—manuscript writing/editing; data collection and analysis; JMS—manuscript writing/editing; ZO—manuscript writing/editing; PG—protocol/project development. All authors state that they have no conflict of interest that might potentially bias they work. The study was approved by the Sechenov University (Moscow, Russia) Institutional Review Board.